A fruit seller looks across as a Somali government soldier stands guard in Afgoye, west of the capital Mogadishu, in Somalia on June 7. 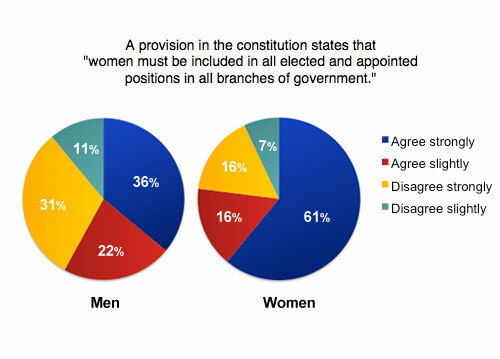 A recent survey reveals widespread agreement on many key provisions of the draft constitution. 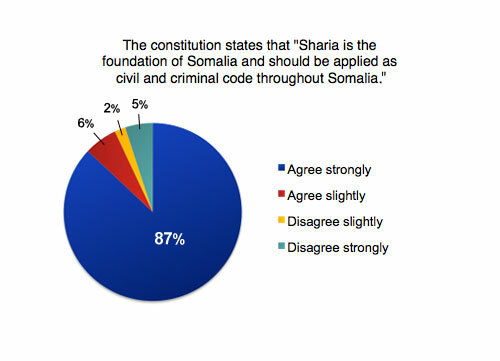 A new Voice of America Somali Service survey reveals many Somalis share similar opinions on key issues regarding the draft constitution that is scheduled to become a provisional ruling document in July. The survey was part of a larger program to engage Somalis around the world in a discussion of the kind of government they want after more than two decades of strife have decimated national institutions. According to Jibril Mohamed, the head of the Somali-focused non-governmental organization, SomaliCAN, the survey provided a much needed platform for Somalis to discuss issues and voice their concerns. Furthermore, it allowed the general population to interact with those drafting the constitution. VOA's Somali Service, using open source software from Google Ideas, polled more than 3,000 Somalis over three months. It was conducted in three parts and polled Somalis around the country and in the Dadaab refugee camp in Kenya. Eighty-seven percent of those surveyed agreed strongly, with another six percent agreeing. Support for Sharia was strong among men and women, across age groups and geographic location. According to Abdulwahid Qalinle, director of the Islamic Law & Human Rights Project at the University of Minnesota Law School, there are two drivers of this overwhelming support for Sharia Law. Qalinle also said Islamic groups did a good job filling voids in social programs, particularly education, citing that many Islamic schools were opened over the past 20 years. The current government appears to support the opinions expressed in this provision. Prime Minister Abdiweli Mohamed Ali told the VOA Somali Service that it is natural that people responded in this way saying, “We are 100 percent Muslims and we believe the new constitution should be Sharia compliant, not necessarily Sharia itself,” he said. However, according to Abdirizak Omar Mohamed, editor of the Somali focused HiiraanOnline, there are some contradictions in the draft that still need further discussion and clarification. Specifically, the lack of provision providing for capital punishment and the acknowledgement that women should have a role in the political sphere do not mesh with the tenets of Sharia, he said. But contrary to what a strict reading of Sharia would say about the role of women in politics, most Somalis think women should be involved in the political process. According to the survey, 77 percent of women agree while only 58 percent of men do. That such a majority of Somalis surveyed believe in some role for women in politics is particularly noteworthy given that the survey interviewed roughly three times more men than women. The dominance of men, said Mohamed, is something to be expected in Somalia where the men tend to be more politically active. In a recent interview with the Somali Service, Prime Minister Ali was very matter of fact in acknowledging the role of women. “What prevents them from becoming head of state? Women [make up more than 50 percent of the Somali population] and they deserve better treatment than we have been according to them in the last few years,” he said. “We believe they are a big component of the labor force of Somalia and they deserve to be part of all the branches of government. At the same time, there is nothing that denies them from becoming leaders. There are so many Muslim countries in the world where women have been leaders - Bangladesh, Pakistan," said Ali. Mr. Ali’s sentiments were echoed by Maryam Qasim, leader of the progressive Tayo Party. Still, over a third of those surveyed oppose any role for women in politics. “It is something people are divided on,” added Qalinle, who pointed out that this question remains an ongoing debate in many Muslim countries. In the survey, Somalis were in agreement about whether a person born outside Somalia to either a Somali mother or father should be considered citizens, with 78 percent agreeing or strongly agreeing. But the older those surveyed were, the more support for broad citizenship eligibility declined. There was more division about whether someone who has been a lawful resident for the past five years should be considered a citizen, with 61 percent of those surveyed disagreeing or strongly disagreeing. In a recent interview with VOA’s Somali Service, Federal and Constitution Minister Abdirahman Hosh Jibril said the issue of citizenship was being deferred for now. On July 10, 825 members selected from traditional elders, intellectual and civil society groups plan to adopt a provisional constitution. The vast majority of Somalis surveyed - 61 percent - said it should be approved through a national referendum, but security concerns and lack of logistical capacity make that impossible now. Men between the ages of 35 and 44 had less support for a referendum, possibly because they are likely “unfamiliar with a constitutional process” and “unfamiliar with how the government works,” said Qalinle. “They have grown in an era where the role of elders was central to Somali life,” he said. What kind of government will emerge once a constitution is in place remains to be seen. According to the survey, 83 percent supported a strong central government as opposed to 13 percent who wanted a weak central government. However, there was discrepancy between those polled in Mogadishu, where 92 percent favored a strong central government compared to 77 percent in Puntland and 83 percent in Somaliland. While there is strong support for a robust central government, the survey indicates many respondents would like to see it balanced with stronger regional government. 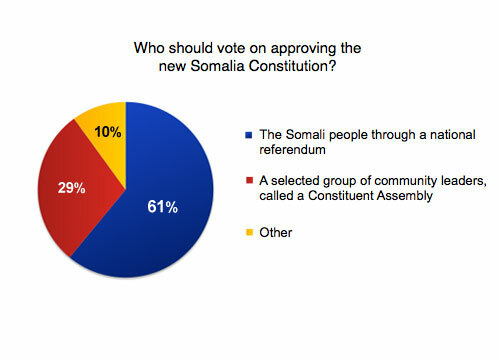 Half of those surveyed in Somaliland disagreed with the notion that regional states should be able to make their own constitutions. In Puntland, over 62 percent agreed with the idea. In Mogadishu, there was a nearly even split between those who agreed and those who disagreed. While a lot remains to be determined, the draft constitution and the subsequent discussion sparked by the survey, has provided an initial framework for a country lacking basic civic structures for so long.